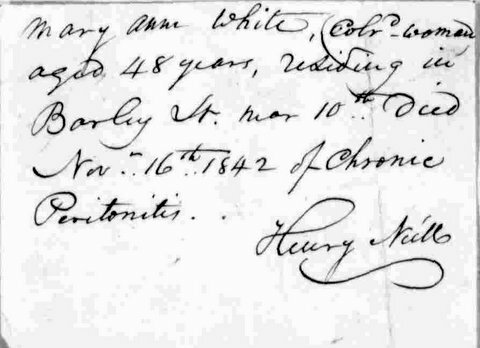 On November 16, 1842, Mary Ann White died at 48 years of age of Chronic Peritonitis. This very painful condition was incurable before the advent of antibiotics. One common manner for a woman to die of this condition was a botched abortion. Some deaths are recorded as caused by an abortion, but more often they are labeled as “Peritonitis.” For more on the subject please see – When Abortion Was a Crime: Women, Medicine, and Law in the United States, by Leslie J. Reagan. Ms. White lived in Barley Street, really an alley, in the Queen Village neighborhood of the city. Barley is now Waverly Street. Below is a photo of this ally as it currently looks. Nearly two dozen people met at 4th Street and Washington Avenue in South Philadelphia on Saturday where they marched several blocks to the Weccacoe playground on Queen Street to honor the remains of some 5,000 African people said to be buried beneath the playground. 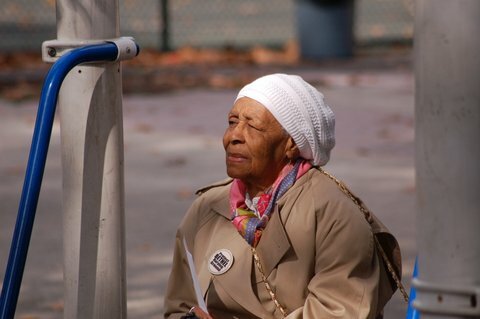 “The City of Philadelphia, Department of Parks and Recreation is trying to renovate the playground with no regard for the graves of our ancestors buried there,” read materials released by the group Friends of Bethel Burial Ground Coalition who organized the event. Supporters gathered wearing traditional African garb, and green, black and red flags were distributed to marchers who met at Fourth and Washington. Once gathered, the group marched from Washington Avenue to Queen Street where they gathered in the playground in which the remains of the dead were said to be buried. Red chalk marked the areas where the bodies were said to be and participants were asked to avoid stepping on the area demarcated. The ceremony began with a call of the drums, in which traditional drummers played as the people gathered at the site. Following the drums was a libation in which the names of those buried were mentioned and ancestors remembered. “We are here to honor the ancestors that are buried about 18 inches beneath the surface of that playground, 5,000 Black ancestors from the 1700s and 1800s,” said Joe Certaine, who organized the event. According to him, those buried founded the Black community in Philadelphia. “At one time this whole area was pretty much relegated to Black residents, and those are the residents that are buried in the cemetery,” he said. Those prayers were conducted on Saturday and the memories of those buried honored during the ceremony. Ron McCoy is a member of the group Avenging the Ancestors and conducted the libation ceremony during the event. Others at the event included Min. Rodney Muhammad of Mosque No. 12 and Rev. Dr. Renee McKenzie of the Church of the Advocate. Coard said Black people ought to be outraged. “Where else in America? Where else in Pennsylvania? Where else in Philadelphia can 5,000 Jewish people, 5,000 Italian people or 5,000 English people be buried under a trash dump and there not be some type of acknowledgment and nobody knows about it?” he asked. Eighteen-year-old Martin Adams died this date, November 13th, in 1847. The cause of death was Consumption. We know the disease today as Tuberculosis. Martin lived on Corn Street (now American Street) below Wharton Street. His home was near 2nd and Christians Street in the Southwark neighborhood now known to some as Queen Village. Tuberculosis was the leading cause of death (17.6%) for those buried at the Bethel Burying Ground. Two-year-old Alfred Matlack died this date, November 12th, in 1848. His cause of death was “Catarrh,” which simply means fever accompanied by mucous secretions. The cause of the fever could have been Pneumonia, Influenza or even Typhus. 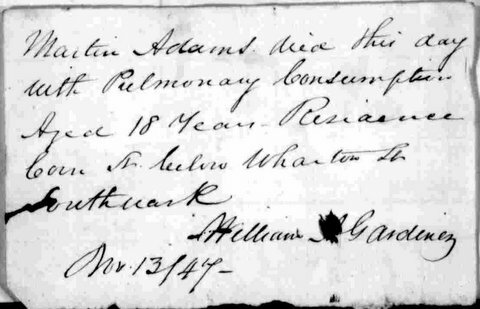 Tragically, the Matlack family would lose another son, 8-month old Thomas to Pneumonia on May 12, 1850. Alfred’s father, James, was a hod carrier which was a laborer employed in carrying bricks to bricklayers or stones and supplies to stonemasons. Alfred’s mother was a wash woman who took in laundry. 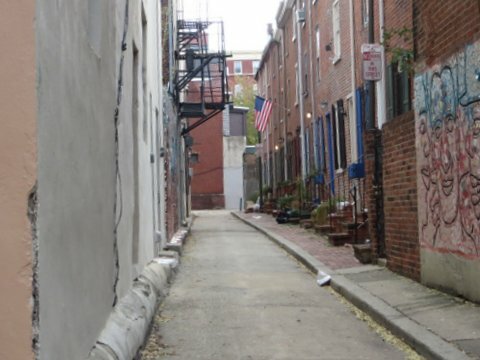 The Matlack family lived in an alley street called Bird’s Court, which was located between Locust and Spruce Streets and 10th and 11th Streets in the Washington Square neighborhood of Philadelphia. Their home would have been very near Pennsylvania Hospital. When initially established in 1810 the Bethel Burying Ground was a rural cemetery. Maps of the era show the land as a pasture used by local farmers for grazing cattle and sheep. There were no paved or graded roads, just dirt paths. However, this “suburb” of Philadelphia quickly grew, eventually placing the small cemetery literally in the backyards of tenements on Catherine Street and row homes on Queen and Weccacoe Streets. And unfortunately in time, like many other graveyards in Philadelphia. BBG fell into poor condition and the trustees of Bethel Church were issued warnings several times in its existence (1810-1889) by the Philadelphia Board of Health to repair and clean up the nuisances asserted by the neighbors that bordered the burial ground. On November 10, 1847 the Philadelphia Board of Health ruled that BBG was a public nuisance following complaints by neighbors and an inspection by Board members. 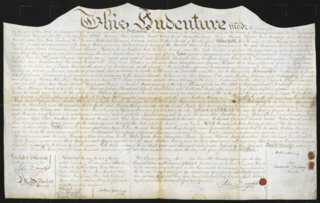 They issued the an order to the Church’s trustees: “You are hereby notified, that in all future interments made therein each body shall be deposited in the grave six feet in depth, and filled up with earth to a level with the proper surface of the ground; and that nobody shall be kept upon any part of the said grounds, or in any place appertinent and thereto, for a longer period than two hours previous to it being interred as above directed.” Philadelphia Board of Health Minutes for November 10, 1847. It appears from the archeological record that the trustees answer to the problems was to build a two-foot high brick wall around the graveyard and backfill it with soil. This not only solved the problem of human remains being exposed, but allowed the trustees to bury more bodies in a very crowded area. “The fact that the cemetery wall is not anchored into the underlying subsoil—but rather sits on top of the buried historic ground surface—and is bounded on either side by visually distinct fill deposits—strongly suggests that this enclosure was originally constructed at or about the time that fill soils were deposited both inside the cemetery grounds and in the adjacent backyards, in order to fill up low-lying areas and level the ground surface. 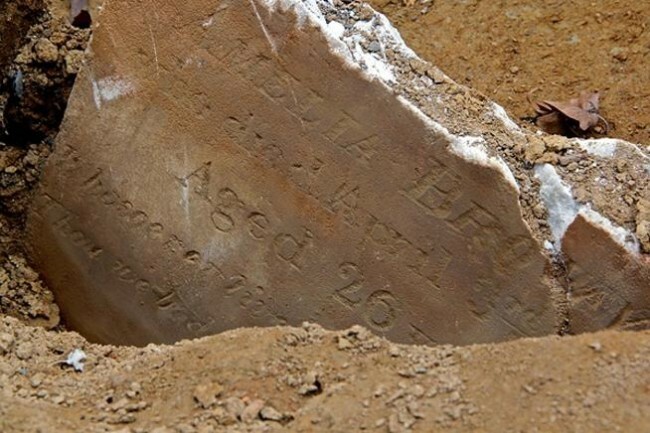 Based on findings from the Phase IA investigation, it was previously thought that this fill was perhaps brought in after the cemetery was closed—possibly during the tenure of Barnabas H. Bartol (1869–1873) or in conjunction with the city’s first improvements to Weccacoe Square in the early 1890s. However, information from the Phase IB study now suggests that this fill material was probably put down at a time relatively late in the period that Mother Bethel was still actively using the burial ground.” (Page 4.1 – Phase IB Archaeological Investigations of the Mother Bethel Burying Ground, 1810 – Circa 1864ER No. 2013-1516-101-A). 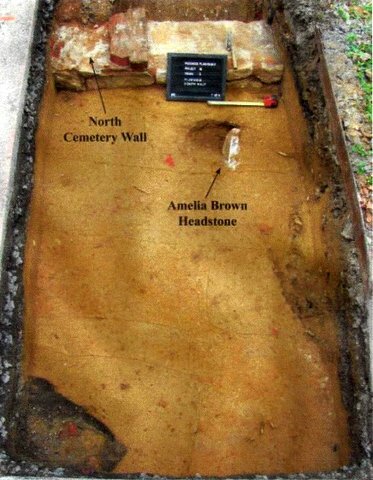 Photo of the north retaining wall of the BBG with the headstone of Amelia Brown protruding from the soil. This photo is in the archeological report page 3.17. Thirty-four-year-old John Goodin died this date, April 3rd, in 1853 and was buried at Bethel Burying Ground.